I can't think of anything I like more than foraging for wild mushrooms. I officially have the 'fever'. 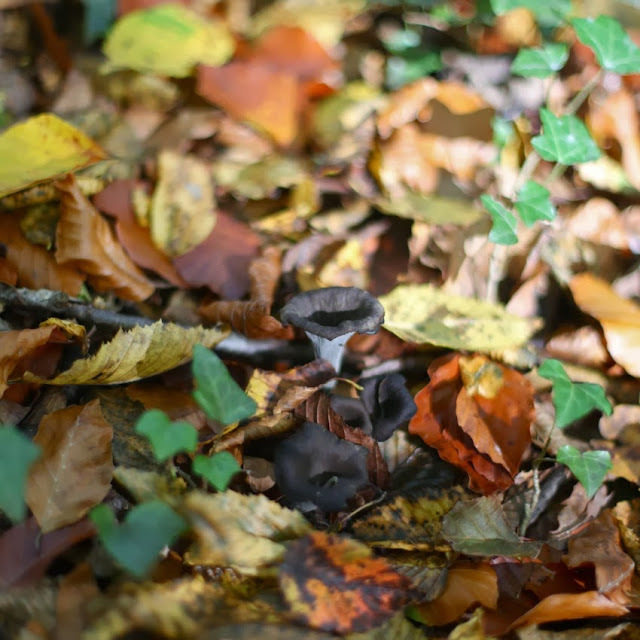 We recently went to one of our favorite french villages, Noyers-sur-Serein, and heard from our trusty friend Oreste, of Le Porte Peinte, that black trumpet mushrooms were plentiful. He drew us a map, which Adrian entered into the rental car's gps, to the Forêt d'Hervaux, a forest favored by locals for mushroom hunting... and not socializing. We hoped to find enough to invent something delicious for dinner. Sure enough, as soon as our eyes focused on the little black velvety flower-like horns, the fever kicked in. 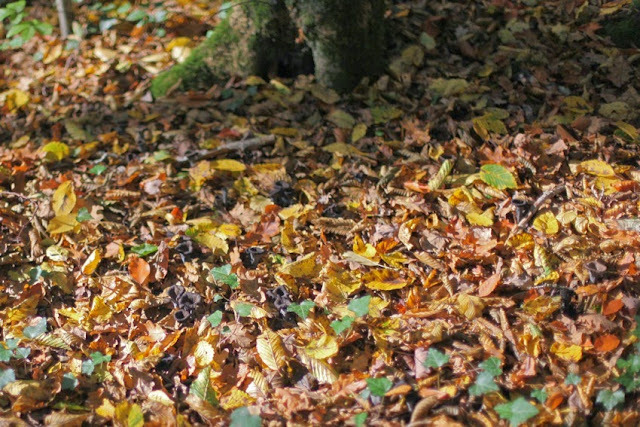 They were scattered everywhere underneath the autumnal leaf carpet. I did a jig like a crazy person. Before hearing the news of the black trumpets, we had stopped by David's farm stand, which he sets up every Saturday morning in the center of the village. David is an ex-computer programmer who left it all behind to cultivate several plots of organic veggies around Noyers. He is super nice and wears a lot of heavy metal t-shirts. We picked out a beautiful butternut squash which soon became Butternut Squash Dauphinois with Trompette de la Mort, trumpet of death (! ), mushrooms. Despite their name, they have an incredibly alive and rich taste. They smell like black truffles combined with chanterelles and have a smokey and slightly sweet flavor. With Thanksgiving in the US around the corner, why not make this as a nice earthy addition the traditional family feast? I'm going to make it for our Thanksgiving which we will be celebrating at a friend's lovely home in Noyers this year. We've got family members coming in from Switzerland and ex-patriot American friends joining in that live in Paris and beyond. Can't wait. Ready for the oven with the last layer of squash, cream, mushrooms, salt, pepper and a few knobs of butter. This is France. Sauté the mushrooms in 1 TBSP of butter and a large pinch of salt. Cook until they are nicely wilted and the water has released out of the mushrooms and cooks off. They should be moist, but not watery. About 5-8 minutes at medium-high heat. Put them in a bowl and set aside. Here is a little tip: When cleaning these guys, make sure you cut them in half in case there are little slugs hanging out in there. I found 3 in my bundle. Peel the squash, cut it in half lengthwise, and scoop all the seeds out. Cut each half again lengthwise, quartering the squash. Slice the squash into 1/4 inch crescent pieces. Put in a bowl and set aside. Grease the inside of your baking dish (mine was about 13 inches wide) generously using 1-2 TBSP of butter, then sprinkle a bit of the chopped garlic and shallots on top of the butter. Pour a swirl of cream over the the entire bottom of the dish. Now let the layering begin! Start with a single layer of squash, then about a quarter of the mushrooms, a good swirl ( about 1/4 cup) of the cream, a bit of the garlic and shallots, and finally a hefty pinch of salt and a few twists of pepper. Repeat this layering process until you run out of ingredients. Portion out each ingredient per layer, with my size dish, I ended up with 4 layers. You will have some odd shaped slices of squash, just puzzle them together the best you can in order to have them sit very close together. You will run out of the garlic and shallots before you are finished, and that's fine. Add it to just 2 of the layers, You don't want to overwhelm the dish with garlic flavor. Once you are finished layering, drop the remaining butter in little clumps on the top and you are good to go. Bake for about 45 minutes to an hour. The top should be a little golden brown when done. As it cools a little, the cream with thicken into a very flavorful sauce that gathers at the bottom. Make sure you serve it with each portion. It's so, so, so good. You might catch a sneaky someone dipping a hunk of bread in that sauce later. To all my readers and friends from the US... HAVE A HAPPY THANKSGIVING! If you want my all time best family recipe for gravy, go here. It really is loved by all. What's for dessert you ask? We have featured two incredible pumpkin pie recipes on here too... one from the inspiring Leela Cyd of Tea Cup Tea.